Nike Air Force 1's. adidas Loop Runners. Nike Frees. Converse Chuck Taylors. Reebok Classics. New Balance 574's. Brooks Glycerin...Finish Line knows sneakers. 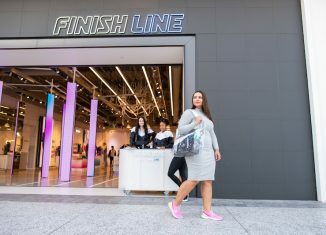 And whether they are for running, training, casual-wear, or just to be stylish, all the information on The Finish Line Blog helps sneaker lovers of all kinds stay in the know about what's coming, the history of sneaks, how women's sneakers influence style, performance features, and more. 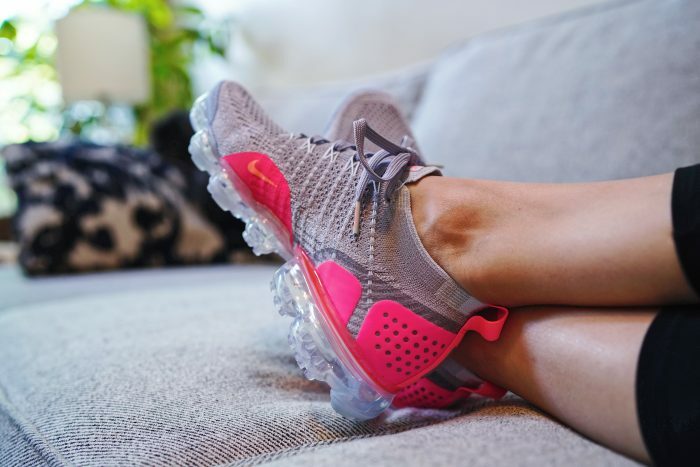 Featuring brands like adidas, adidas Originals, ASICS, Nike, Nike Sportswear, Reebok, Saucony, New Balance, Mizuno, Brooks, Under Armour, Timberlands, The Finish Line Blog knows women's sneakers. 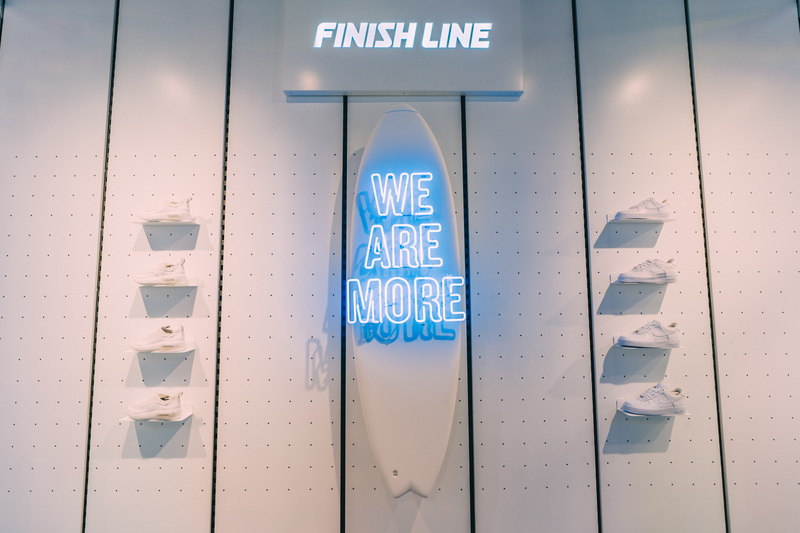 What a great start to our #WeAreMore event at Finish Line Century City. 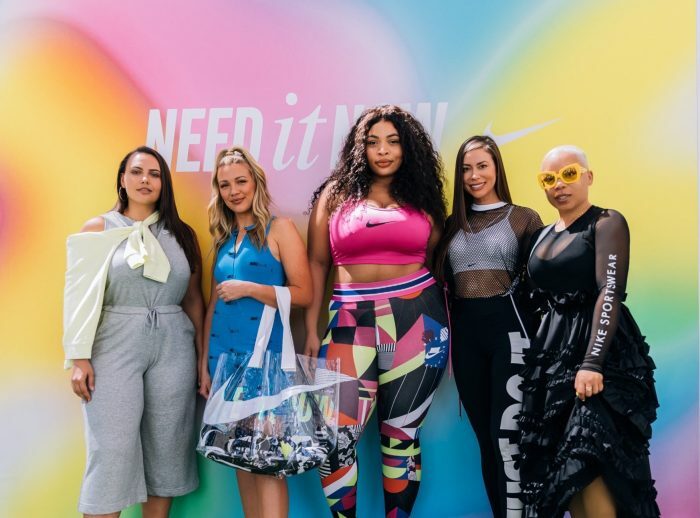 The latest styles from #NikeNeedItNow and special installments such as @mrflowerfantastic. Only fun, fierce and fabulousness stepped through the Finish Line doors this weekend and we’re excited to share some of our favorite views. The man of the flower hour was the one and only, @mrflowerfantastic. 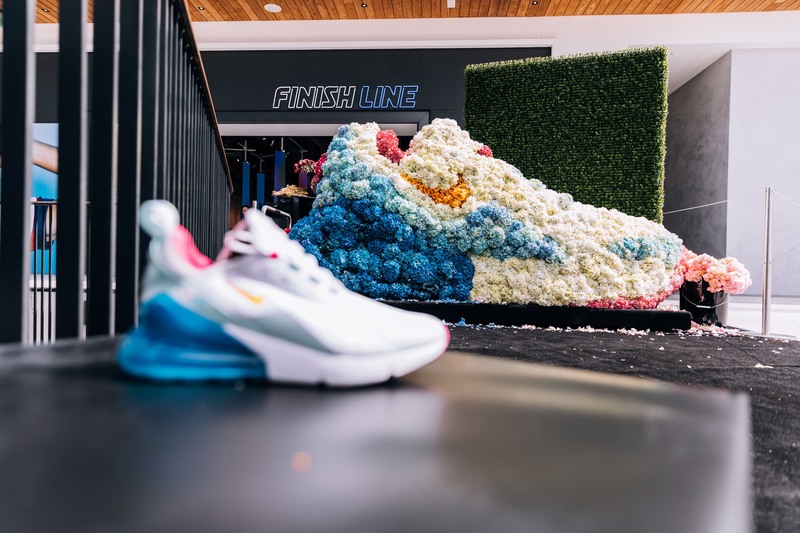 Creating arrangements resembling the Air Max 270 and 720. 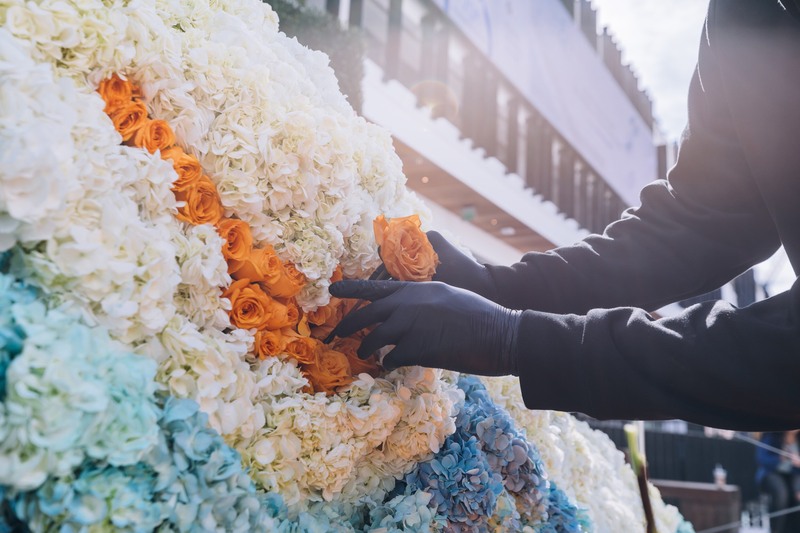 Guests were able to leave with fresh bouquets and it was one of the best spots in house for a photo op in front of colorful displays. 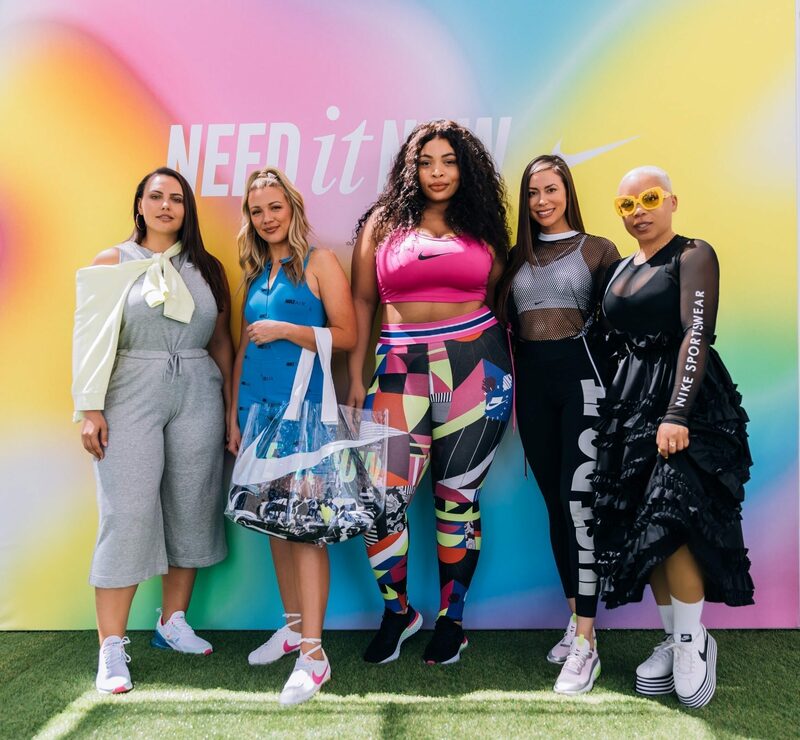 Celebrity wardrobe stylist, personal shopper and global fashionista, Charlie Brianna lead the discussion of outfitting the athlete in HER. 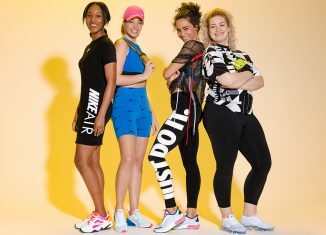 #WeAreMore at Finish Line is all about women who embody versatility, positivity, functionality and style. 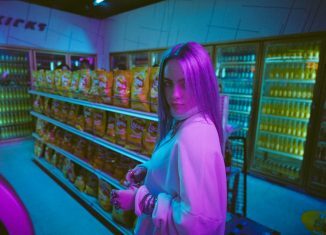 It’s driven by the belief that she is more than labels can define and that is what Charlie presented. 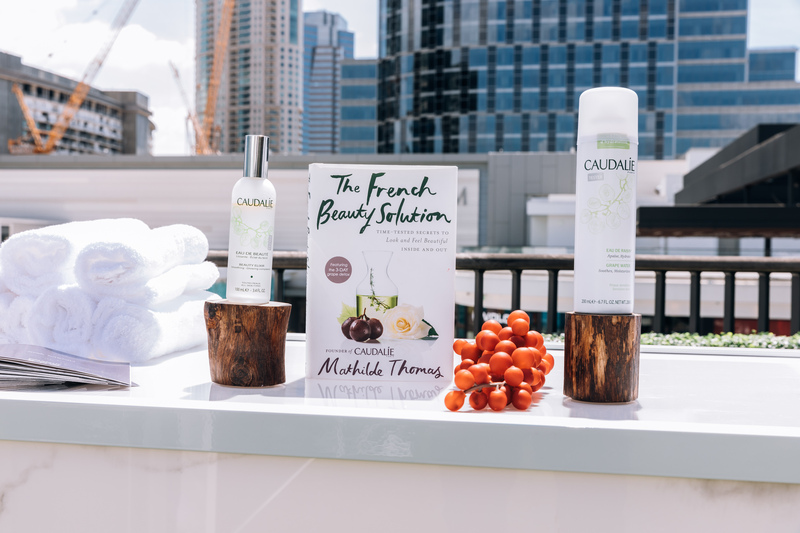 Caudalíe, natural cosmetic treatments and beauty products provided mini facials as well as offering beauty elixirs and grape fast mists. 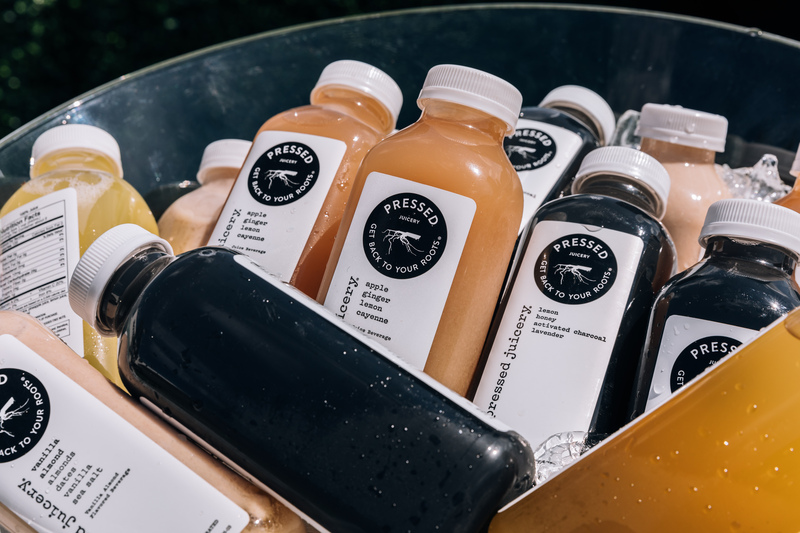 Pressed Juicery offered juice flavors, granola bars and gummy snacks. La Colombe was on display with several flavors of their iced coffees and last but certainly not least, Sweetgreen allowed customers who registered for a session a redeemable card upon exiting. 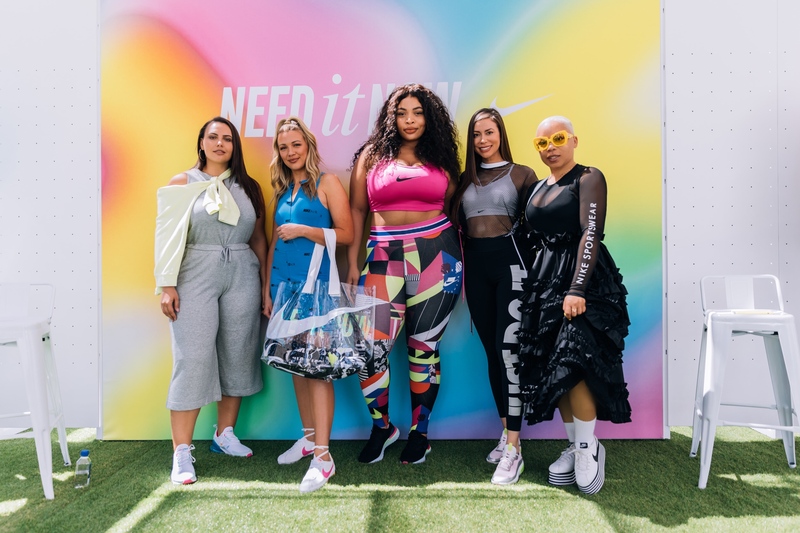 Throughout the one of a kind build out in store, customers were able to shop the latest US Women’s National Team soccer jerseys and the NEW Nike styles through our Need It Now collection. 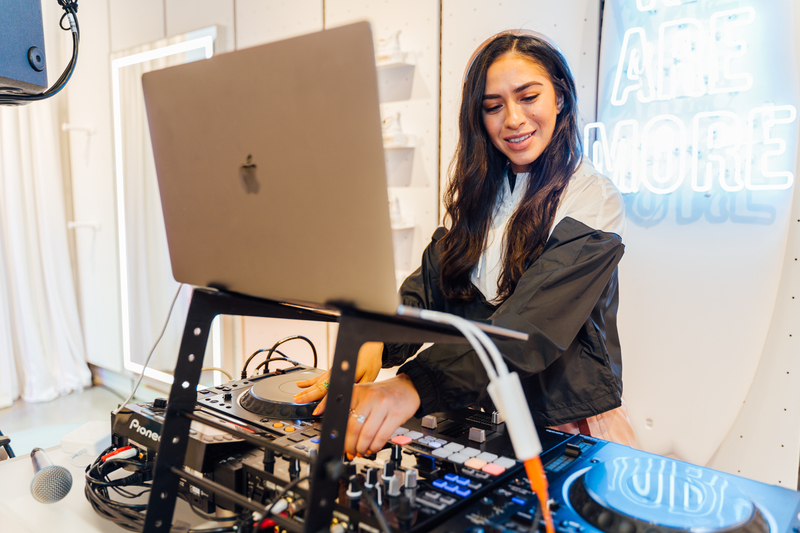 We also featured special guest DJ, @orangecalderon to get down to the best hits, while shopping the best Nike items. Don’t miss out on this week! 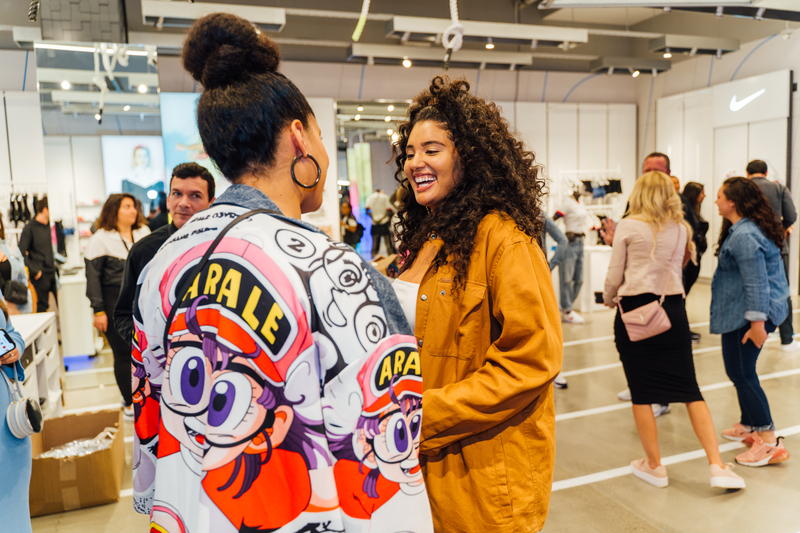 There are more chances to sign up for sessions with celebrity stylists and trainers. 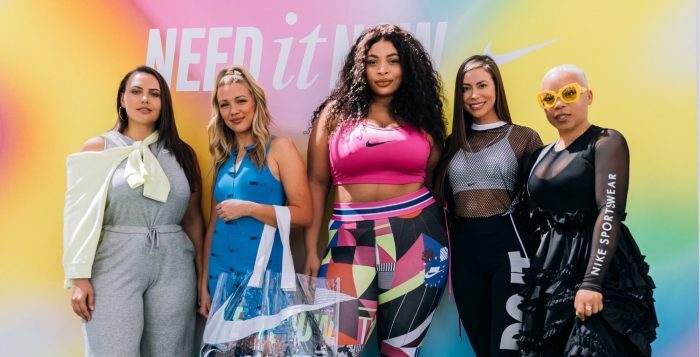 Click over to our sign up blog and make sure you experience this #WeAreMore Nike Women moment before it’s gone. 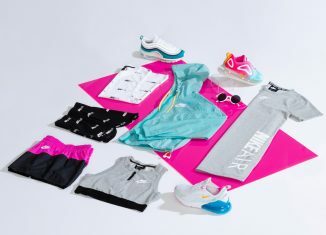 For more details follow @finishlinewomen and shop the #NikeNeedItNow styles today at www.finishline.com. Blossom is making life easy this spring and showing us how to transform our wardrobe for the upcoming season. 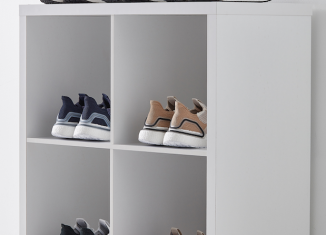 Featuring the exclusive women’s sneaker, the adidas Sleek, these winter to spring looks are easy, cute and ready to walk the streets. 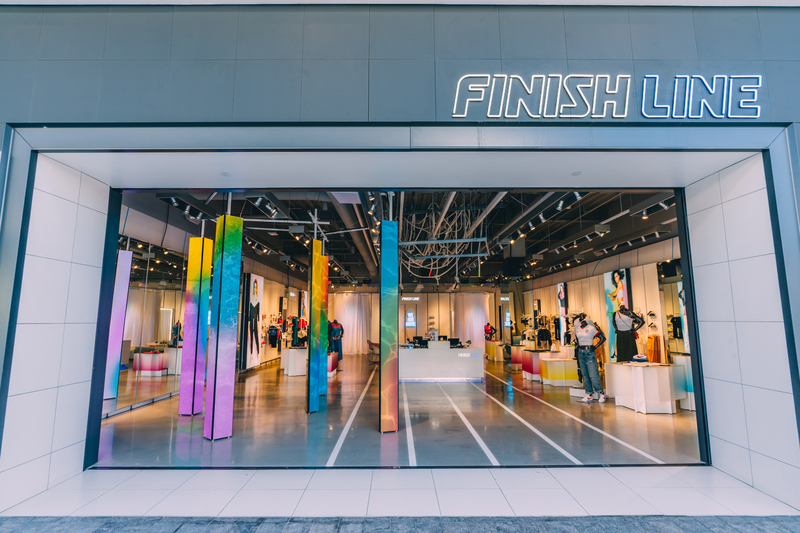 Check out the below videos and follow @finishlinewomen to learn more about how you can #FinishTheLook. This first style features an oversized adidas Originals Trefoil T-Shirt. Blossom did what they do best by creating an adorable strapless dress with pockets. How easy, right!? As a final touch, they wrapped a jean jacket around the waist and the white adidas Sleek brought everything together. All eyes on this adidas Originals Tulle Skirt! Front and center and keeping it cool. A great look for spring that you can easily wear to many occasions. It’s no surprise that the Sleek also matches this outfit effortlessly. You could even pair this with your favorite cropped t-shirt or tank. Taking the adidas Originals Trefoil 3-Stripes Leggings and turning it into a long sleeve crop has us all giddy inside. This style is everything, especially with the adidas Originals Waist Pack. 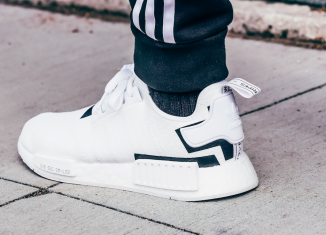 The look is versatile and minimal with the adidas Sleek and can pair with your favorite denim bottom or a cozy drawstring pant. Last, but certainly not least, this oversized adidas Allover Print Hoodie is an easy way to have a matching set in your closet this spring. 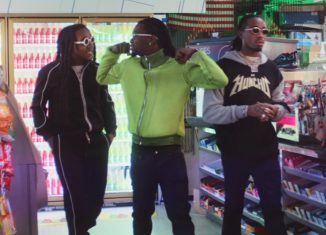 By customizing the hoodie into a crop silhouette and making the bottom half a skirt by applying some nifty maneuvers, you get a trendy sneaker style that keeps you on #teamcozy. 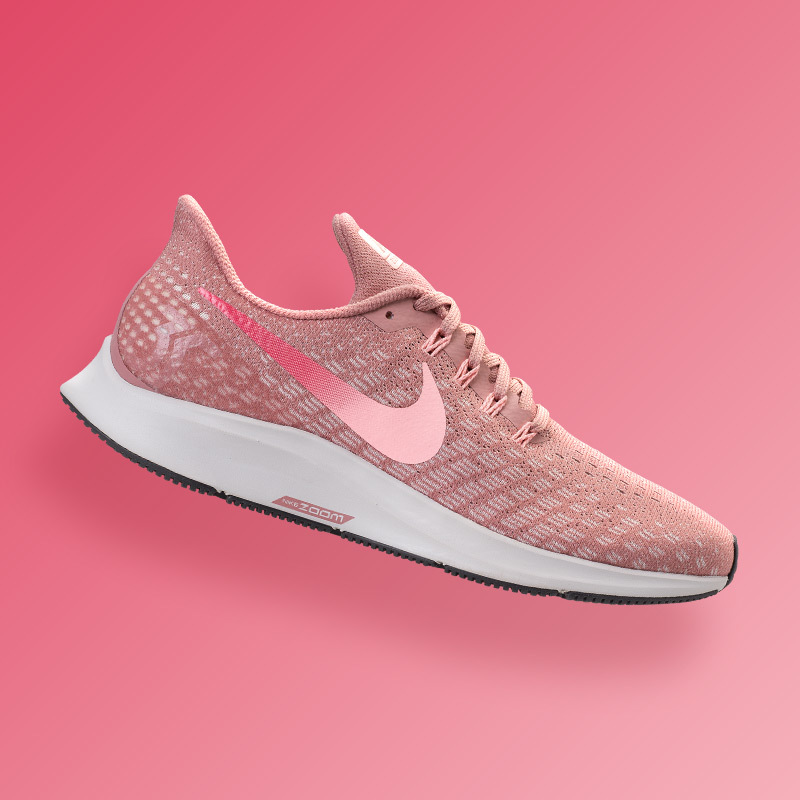 Such an appropriate Valentine’s Day colorway is coming for the ladies. 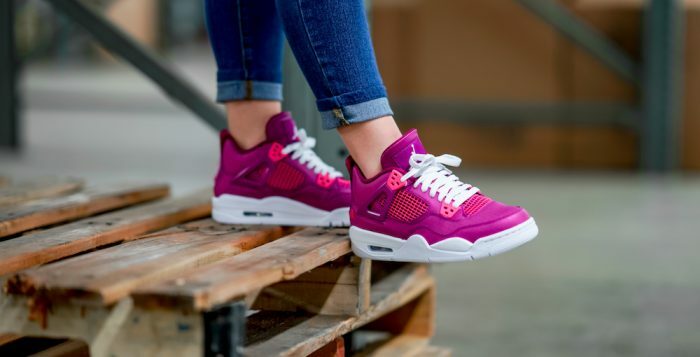 The Air Jordan Retro 4 takes on a standout True Berry shade that is perfect for the month of February. Coming in big kid’s sizing, you would want to size down 1.5 for a good fit and rock these kicks with a festive look. The True Berry also stands out against the White and Rush Pink accents. 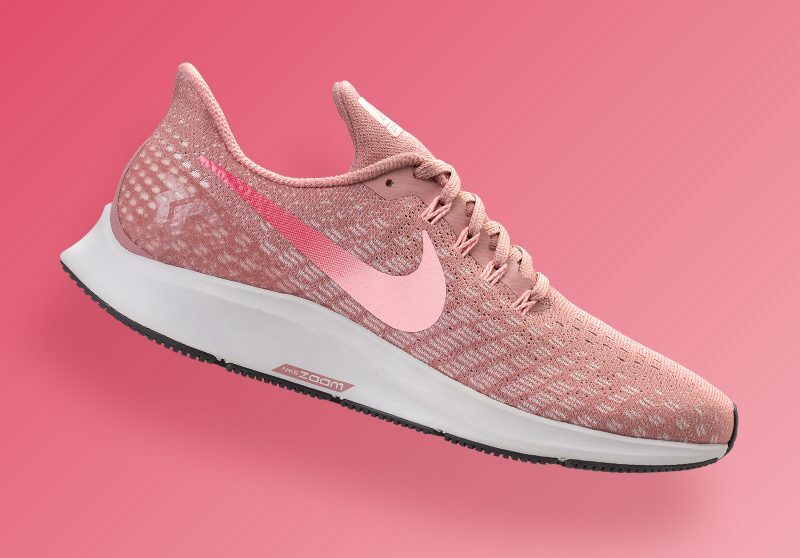 The White takes up the Jumpman logo, laces and full midsole and outsole, while the Rush Pink is on the netting and wings. 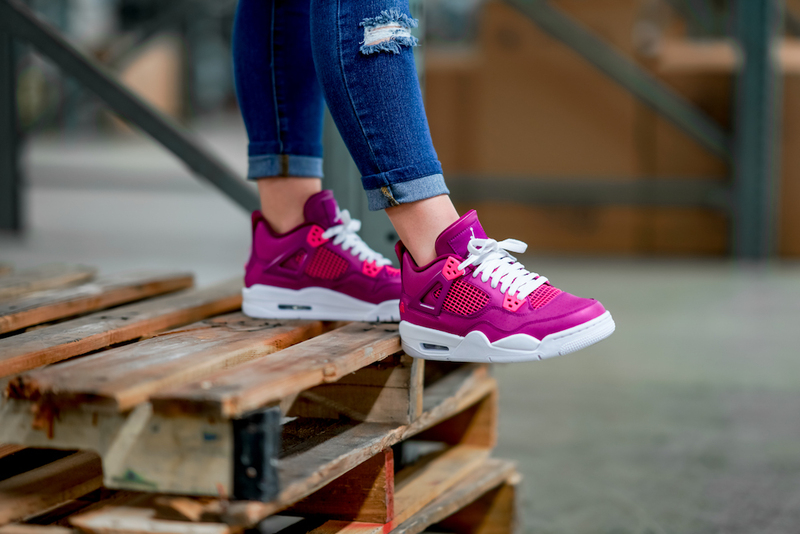 Get your pair of the Kid’s Air Jordan Retro 4 ‘True Berry’ 2/9 at finishline.com. A new silhouette calls for a new face for adidas Originals and who better than Kylie Jenner. 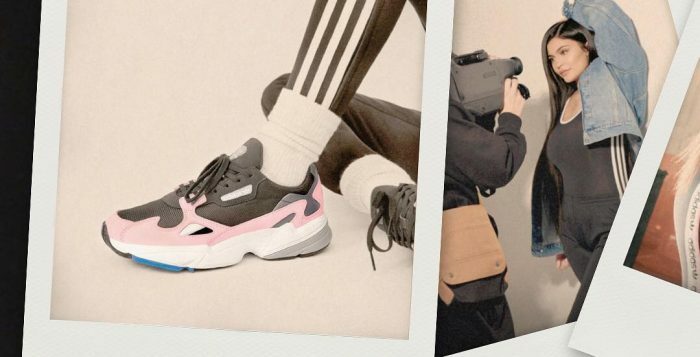 Taking on the latest Falcon sneaker, the 21 year old represents all aspects of the campaign from style, aesthetic and 90’s fashion roots. Kylie has taken to Instagram to reveal the news and we’re loving her vibes in the Falcon design. 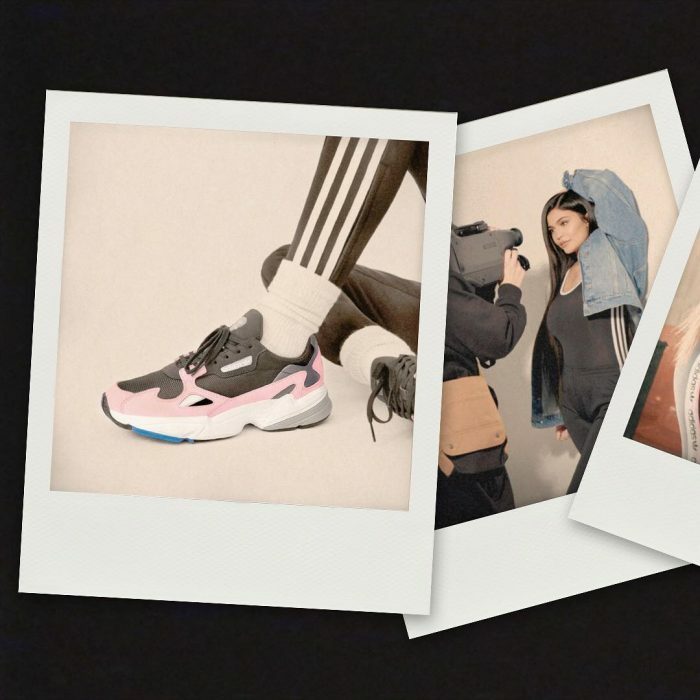 adidas Originals dug into the archives by bringing back an iconic silhouette for a contemporary trend and as one of the most popular trend setters around, Kylie couldn’t be a better person to show off the Falcon. 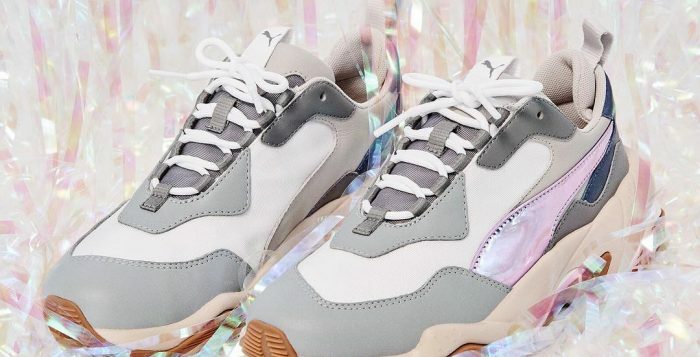 The sneaker features a full out design of a paneled upper with mesh and suede overlays. Reflective detailing adds a pop with color on the upper and outsole as well. 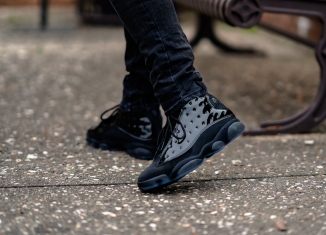 We can’t forget about the chunky rubber midsole that sets this trend a part and makes the design what it is in the world of sneaker trends. 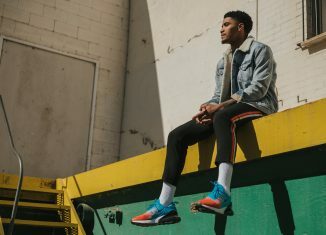 You can get your pair of the adidas Originals Falcon on 9/6 at finishline.com. 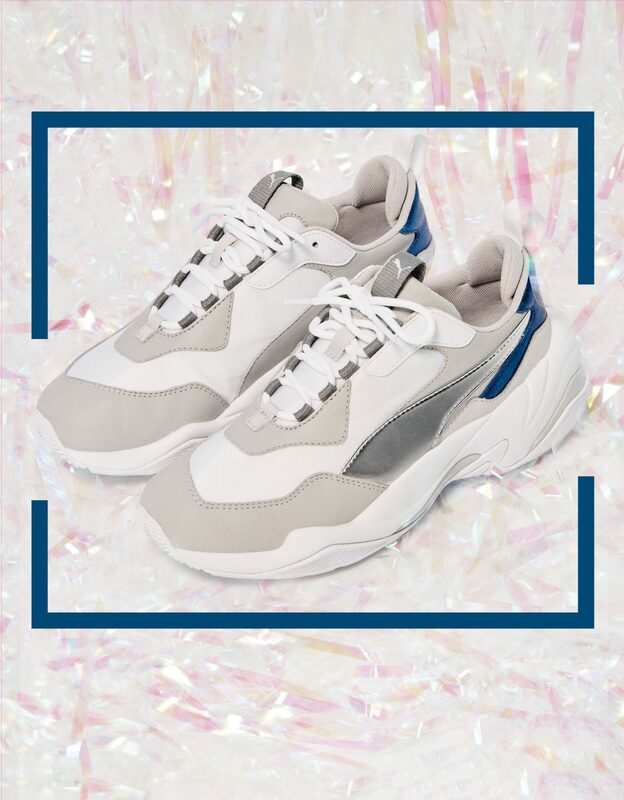 The chunky sneaker trend is here with the upcoming style from Puma. 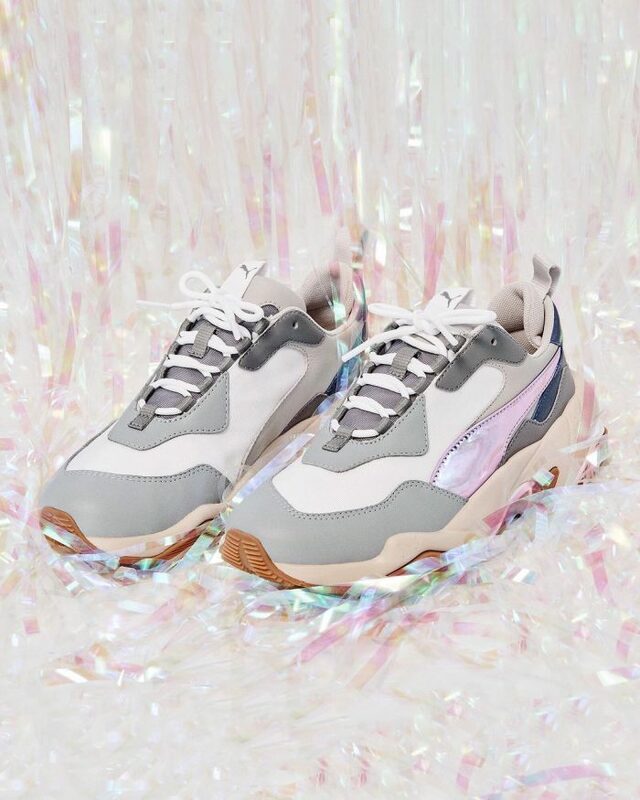 Ladies, keep up with the latest trend and add the Puma Thunder Electric to your rotation for the summer months. 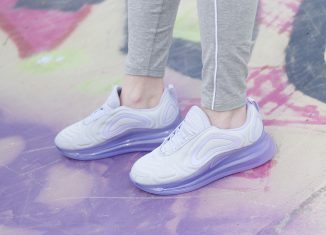 Coming in a Pink Lavender and Grey Violet the colorways are complimentary to this sneaker’s design. 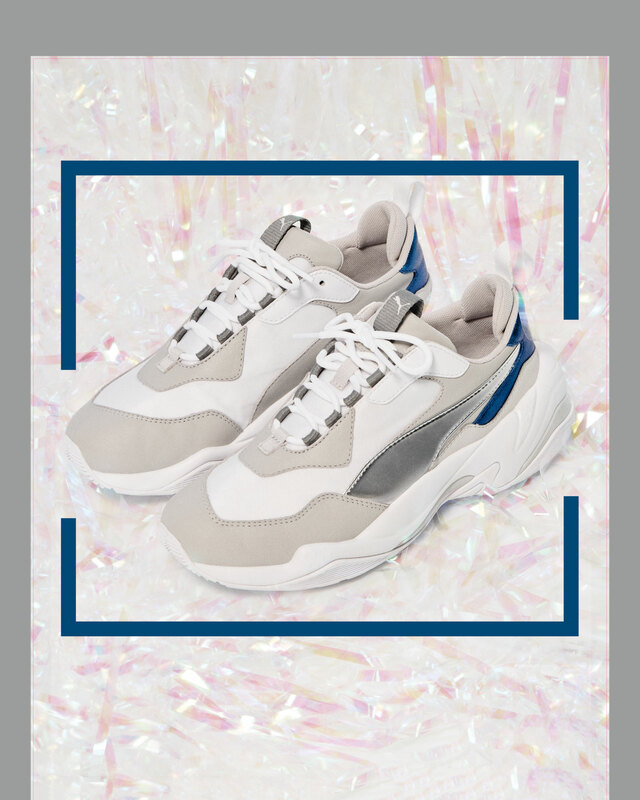 Inspired by ’90s fashion, like McQueen trainers, the Thunder Electric boasts color contrasting a multi-layered midsole and bold proportions. You will definitely catch eyes in this style. 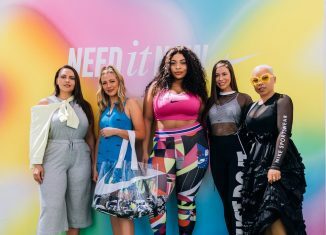 Ladies, grab your pair of the PUMA Thunder Electric on June 28th at Finishline.com. 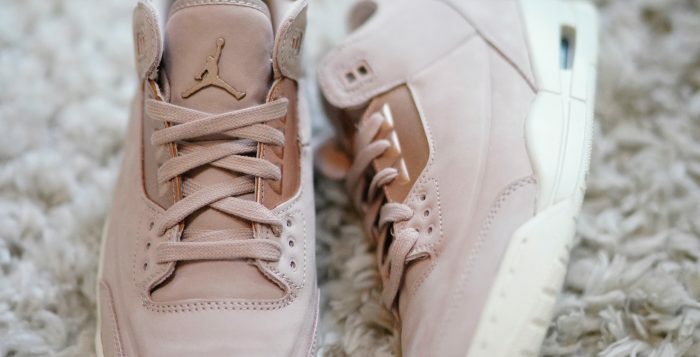 We are loving what’s next for the ladies with Jordan Brand. 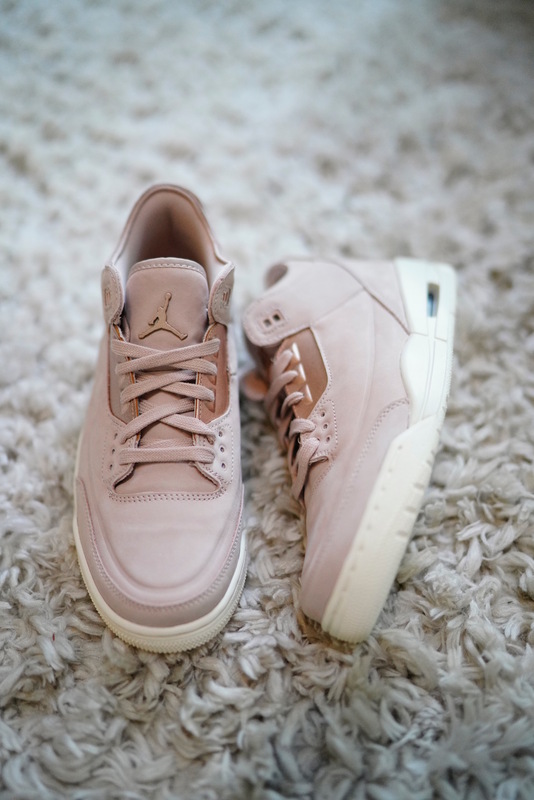 This Retro 3 in Particle Beige is super clean with simple and sweet detailing of metallic highlights. The beige nubuck upper contrasts nicely with the red-bronze metallic hits along the eyestay, heel and tongue logo. 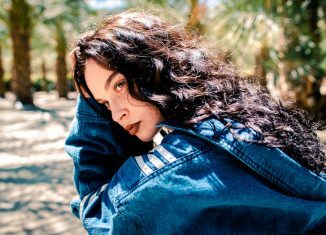 Your favorite pair of jeans, leggings, joggers or bodycon dresses are styles that can definitely take on this silhouette. 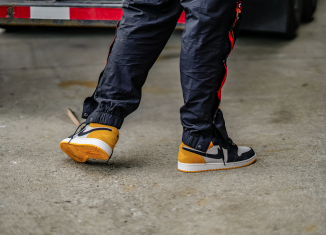 You don’t want to miss the opportunity to add these to your rotation. 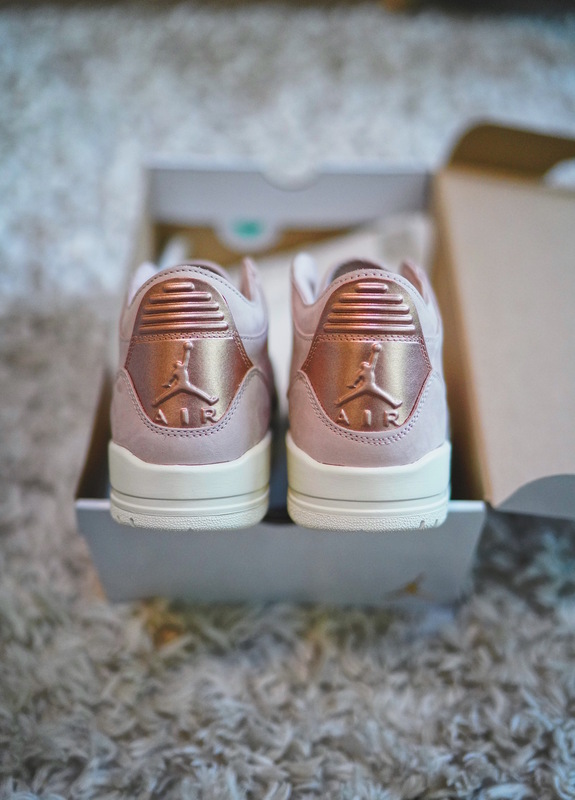 Get your pair of the Women’s Air Jordan 3 ‘Particle Beige’ on 6/8 at finishline.com. The VaporMax is continuing to be a top style in 2018 and with the assortment of different colorways, it’s hard to pass up on one of the most innovative designs in Nike’s Air Max family. This next colorway is showing an Atmosphere Grey on the flyknit upper and Crimson-Sunset Glow around the base. 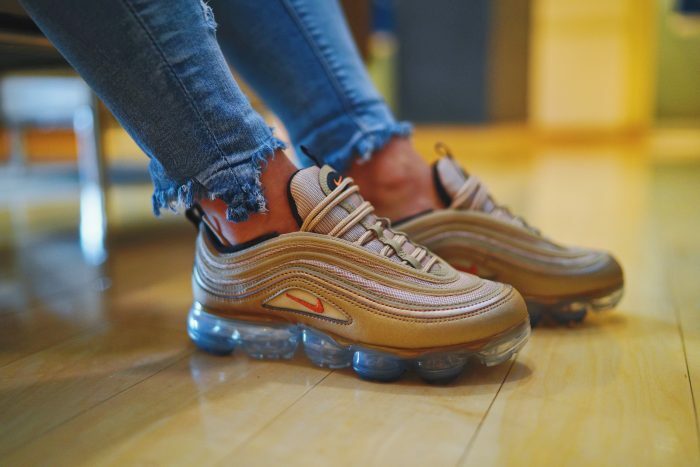 The Air Max unit is a clear bottom and gives the entire look a fresh appeal. 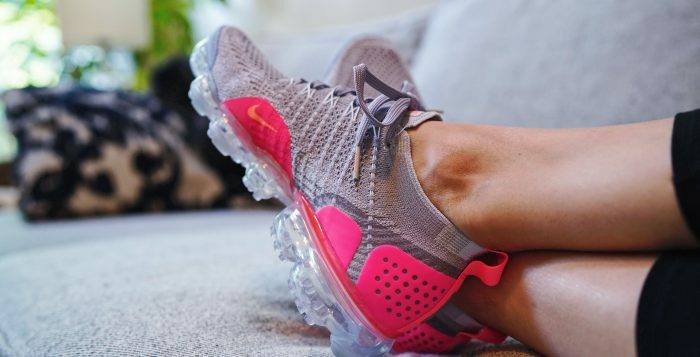 Bring your VaporMax rotation up to speed with the latest for your athleisure wardrobe and enjoy your summer with a pop of color. 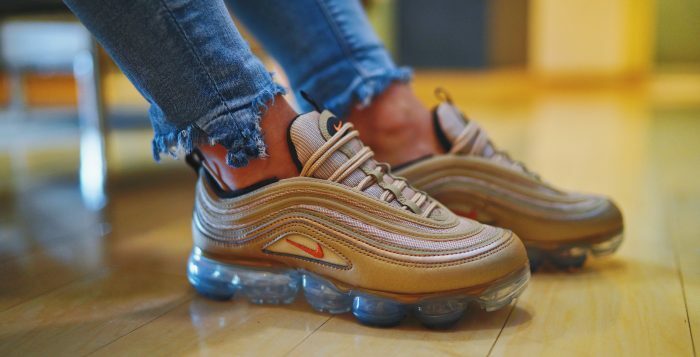 This Women’s Nike Air VaporMax 2 will be available Thursday 6/7 at finishline.com.